First you want to create your Salt Dough. In a medium to large bowl add in your salt and flour and slowly pour in water a little at a time . You want your dough to be the same consistency as play dough, so feel free to add in ingredients as you see fit. Once your dough is made you want to roll it out. Make your dough as thick as you desire. Remember the thicker it is the longer your keepsake may take to bake. You want to make sure it is at least 2 cm thick to prevent breaking. Now begin to cut your pumpkin shapes you may use a premade stencil or freehand cut it out. I choose to free hand mine. Once you have your pumpkin all cut and ready you can then decide how you want them. Will you add a hand or foot print? Cut out for photo? Or simply leave it plain with your little ones name? It’s totally up to you and your little one(s) creativity. For my kids I decided to do a cut out for a picture for the oldest and a handprint for the baby. Once you decide what you will make of your pumpkin it is time to bake. You will want to bake for 2-3 hours on 300 degrees and check periodically. You may bake longer depending on how thick you choose to make your keepsake. You also may need to flip over to make sure baked all the way through. 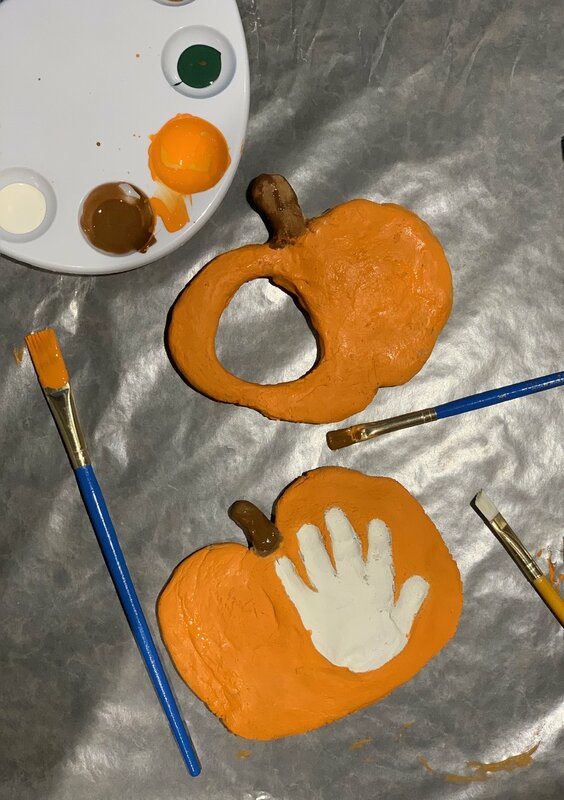 Now that your pumpkin is baked and cooled (I allowed my pumpkins to dry over night) it’s time to let your little one(s) get creative. I love using Craft Smart acrylic paints from Michaels Craft Store. They are really easy to clean up if you do happen to spill some and the colors are bright and beautiful. They are also very inexpensive, and can be purchased in single colors or color combination packs. Feel free to let your little one(s) paint their pumpkin anyway they want. Once your finished allow your keepsake to dry completely. Once it’s dry you may choose to use a sharpie to add your child’s name, the year, etc to your keepsake. The purpose of this project is to create lasting memories. Time goes so quickly and we should take more time creating these memories with our children.